Is the Gastric Band still a good option? The gastric bypass revolutionized weight loss surgery in 1990’s. Since that time, tens of thousands of this procedure have been performed with incredible success. Why did the bypass become less favorable then? First and foremost, it is a very intricate surgery that involves rerouting intestines and making a very small stomach pouch with which to attach the new intestinal loop. It is very effective but had multiple complications and many surgeons were not proficient enough at the procedure. The complications included bleeding, narrowings at the new pouch causing severe problems keeping food down and perforations or leaks from the new stomach. Dumping syndrome also was a major issue with this procedure. Smoking made many of these complications much more common and severe. Around 2005 the gastric band procedure became popular in the USA and took off like a rocket. Why did this happen? The gastric band’s overnight success was several fold. First and foremost it was reversible. Also the procedure was much less complicated and the recovery was quicker. It was a miracle for weight loss surgery. But, after years and years of the procedure, the drawbacks to the procedure became evident. The question now stands about the gastric band: Is it still a good option? What lead to its equally rapid decline? Firstly, patients had to spend upwards of $200 each time they wanted their band filled with more fluid to increase their restriction and therefore continue their weight loss. This put a financial burden on many people. Then the medical problems started to show up. Patients started to have gastric prolapses. This is where part of the stomach below where the band is located slips up through the band and causes pain, vomiting, and requires emergency surgery. This possibly could lead to that portion of the stomach to have issue with blood supply also. During the start of anesthesia, gastric prolapse also makes patients much more prone to aspiration which can lead to a debilitating pneumonia and even death. Also associated with the gastric band are band erosions. This sounds gross and it is. This is where over a period of time, usually years, the band itself actually erodes or eats through the stomach wall and into the stomach. Just today we did an endoscopy on a patient suspected of having an erosion and what did we see? A gastric band sitting inside his stomach. The patient is now scheduled for a gastric band removal. What are the symptoms of an erosion? They are not as horrific as you may think. Typically, the band port will become infected and this may be the only symptom. Patients may also experience weight gain since the band is no longer functional. Patients also have experienced dilation of their esophagus, leaks in their ports or port tubing, ports becoming turned or twisted or loose, pain at the port site, disconnections of the port from the gastric band, and severe reflux or heartburn. 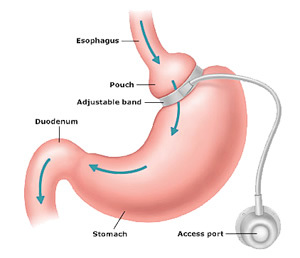 At our practice, we are now removing more gastric bands than we are putting in and do not recommend the procedure any more unless a patient insists on it. Why has the miracle weight loss surgery turned sour? Besides all of the above possible complications, patients would still want the procedure because many people are desperate to lose weight and it is much less invasive than the bypass, if it were the best option. In one word I can describe why the band has had a rapid decline: Sleeve. In 2008, we began performing the gastric sleeve and quickly realized how superior the procedure was to both the bypass and band. In fact today, it comprises well over 95% of all weight loss surgeries we perform. The recovery is very quick like the gastric band and the health benefits easily rival those of the gastric bypass as far as remission of diabetes among others. This is on top of less need for continuous follow that makes it by far the most maintenance free weight loss surgery. There are still potential complications such as dysphagia, narrowings of the sleeve and such, but these are seen at a significantly lower rate than with the other procedures. It is the best procedure if you are going to have weight loss surgery today. But just because it is better, this does not mean you should let any weight loss surgeon perform it. Experience is what counts and minimizes your risks and complications. We have performed many thousands of gastric sleeve surgeries and have perfected and refined our techniques over the last 7 to 8 years. If you are considering weight loss surgery, you should look very closely at the Vertical Sleeve Gastrectomy and New You Sleeve. The Sleeve Gastrectomy is an incredible weight loss procedure for those who have failed diets and are looking for a surgical option. In our opinion, it is by far the best procedure and provides amazing results. I have just had my Gastric band removed after six years. I feel much better and eat more healthy. Before I would eat food that was easy to swallow and didn’t get stuck. Chocolate never let you down. My diet was so unhealthy. Now I can eat healthy foods. Fruit, bread and meat. The three main things I was deprived of before. I can even enjoy a hot cup of tea. It has been agony. Eating and drinking slowly. Vomiting nearly every day. The pain is terrible. I will look after myself now. I do not want to eat cchocoltes, deserts, or corn crisps again. I lost five stone with the gastric band and I intend to keep the weight off. I have bought myself a fitness machine and I am going to have a full tummy tuck. This will help and encourage me. I have just had my Gastric band removed after six years. I feel much better and eat more healthy. Before I would eat food that was easy to swallow and didn’t get stuck. Chocolate never let you down. My diet was so unhealthy. Now I can eat healthy foods. Fruit, bread and meat. The three main things I was deprived of before. I can even enjoy a hot cup of tea. It has been agony. Eating and drinking slowly. Vomiting nearly every day. The pain is terrible. I will look after myself now. I do not want to eat chocoltes, deserts, or corn crisps again. I lost five stone with the gastric band and I intend to keep the weight off. I have bought myself a fitness machine and I am going to have a full tummy tuck. This will help and encourage me.